Silas William Patterson Richardson, also known as "William P. Richardson," son of Matthew Richardson and Catherine Draper, was born in Washington County, Pennsylvania in 1833. This county was the location of the founding of "The Christian Association of Washington" by Thomas Campbell in 1809. Following the arrival of Campbell’s son Alexander, the Association became the "Brush Run Church" in 1811. So growing up in this area, only a few miles east of Bethany, West Virginia where the Campbells had become actively involved in planting churches of Christ, it is probable that Richardson was influenced by their message early in life. By age 17 Richardson was working as a farm hand in Washington County on the farm of William Cowen. He was married three times. His first wife was Elizabeth Ann Allen, cousin of Revolutionary War hero Ethan Allen, whom he married in 1856 when he was 23 years old. They had five children: Mary Alice, Catherine Lucy, Elizabeth, June Ellen and William. Richardson married Harriet Myers on Oct. 30, 1867 (possibly Elizabeth Ann had left him when Richardson was converted in August of 1867, because she did not die until Mar. 6, 1871). When 31 years of age, on Feb. 23, 1965, Richardson enlisted in the Union Army Infantry, giving his occupation as "Teacher." He is described in military records as having fair complexion, black hair, blue eyes and 5’8" tall. While stationed in Tullahoma, Tennessee he contracted a nasal catarrh and varicose veins on his left leg, which led to his discharge on Sept. 4 of that same year. Following his conversion in 1867, Richardson became a member of the Christian Conference (probably what was also known as the "Christian Connection") of Rayshill, Pennsylvania and was ordained to the ministry by the Clearville Conference in 1867. He spent the next 12 years as a traveling missionary in Pennsylvania, Maryland and West Virginia. His marriage to Harriet Myers produced four children: Ida May, Harriet Abigail, Asa Odo and Hannah Etta. As with many persons of his day, Richardson eventually migrated west and became the preacher at a Rockport, Missouri church in 1882. A year later Richardson united with the Church of Christ (Disciples of Christ). Then, early in 1884 he moved to Tecumseh, Nebraska where Harriet died on July 7, 1885. At 52, Richardson married Mrs. Jeanette "Nettie" Armstrong, a school teacher, on Nov. 26 of that year. This union produced two children; the first was Carl Foster was born in 1887. When Carl was only one month old, Richardson immigrated to Independence, Oregon, where he became preacher of the Christian Church, which had just finished construction on its new building. The following year (1888) he moved to Garfield, (eastern) Washington Territory, and organized a church of 22 members there, also becoming the County evangelist for the Disciples in 1889. Garfield had been named after the late President, who was also a preacher among Christian Churches. Richardson’s last child, Glenn Errett, was born in Garfield on Feb. 2, 1889 (it seems probable that this boy’s middle name was given in honor of Isaac Errett, Editor of the Christian Standard, who had passed away just 45 days earlier). When Glenn was only three weeks old Richardson again moved, this time to Athena, Oregon, where he ministered to the Christian Church from 1889-1890. While there he had an article titled "Ye Men of Athena" published in the July 27, 1889 issue of the Christian Standard (an obvious allusion to Acts 17:22). The "Oregon/Washington/Idaho Gazetteer and Business Directory" for 1891-1892 lists Richardson’s name among "Christian Clergy" in Goldendale, Washington. It appears he enjoyed traveling throughout his ministry, perhaps having become accustomed to it during his itinerant years with the Clearville Conference (1860s-1870s). In 1892 Richardson settled in Falls City, Oregon, where he and his wife are listed as charter members of the Christian Church in that town. By 1895 Richardson was preaching in Myrtle Creek, Oregon, as correspondence between him and his son Asa bears out. By July 1896 he had applied for admission to the Oregon Soldiers’ Home in Douglas County, Oregon, although the 1899 Yearbook of the Disciple of Christ lists him as still preaching in Myrtle Creek at that time. According to the 1900 Federal Census, Richardson’s age is given as 67 years old and he is living there, along with his wife Nettie (57) and two sons (Carl, 13, and Glenn, 11). Richardson is recorded as preaching the funeral for a fellow-preacher, J. B. Smith, at Myrtle Creek on Feb. 7, 1901. He himself finished his earthly pilgrimage a few months later, on June 5, 1901, and was buried in the IOOF Cemetery in Myrtle Creek. His son Glenn was later buried at his feet in an unmarked grave. 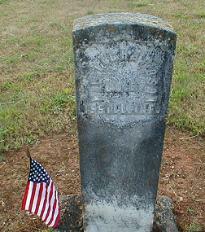 Richardson’s wife Nettie was dropped from a pension roll on Nov. 3, 1921 upon her death. With the excellent cooperation of Fred Olson of the Myrtle Creek Family Funeral Home, we were able to locate Mr. Richardson's weathered marker in the IOOF Cemetery at Myrtle Creek, Oregon. While we could not have located it by reading the marker, yet knowing that was the proper location from the records, we were able to make out "Richardson" on the stone. Also the letters "INF" appear, and by comparing with other stones from that era, it appears to identify Mr. Richardson as a member of the U. S. Infantry. This is further confirmed by the flag placed by a veteran's organization because it was Memorial Day weekend. This sketch of Mr. Richardson's life has been a team affair. Kayla Durfee of Athena, Oregon located the family connection while researching the lives of past preachers at Athena. The basic timeline has been compiled by Peggy Dinges, a descendent of Mr. Richardson. 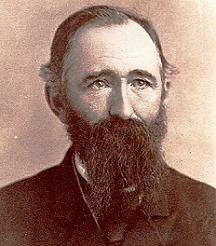 William E. Paul of Franktown, Colorado compiled the information into a story. Charles Dailey has researched Mr. Richarson's burial location and edited the final copy.